A strong mark and accurate kick, Barry Hall developed into an example of what was seen as a ‘dying breed’ in his era, a power full-forward who played exclusively in that role. Hall began his AFL career in 1996 and played as a centre-half-forward for much of his first three seasons. But a three-goal burst in just five minutes during the 1997 Grand Final gave coaches and fans alike a hint of Hall’s potential as a permanent full-forward. In 1999 this transition took place and from then until his retirement at the end of the 2011 season, Hall kicked at least 40 goals in all but two of those seasons. Hall’s aggressive ‘pack-splitting’ approach certainly enable his forward team-mates to stand taller and it led to commentator Ian Robertson bestowing the name ‘Big Bad Bustling Barry’ upon him. That approach, however, led Hall to at times straddle the line of fair-play, and he was to incur the wrath of the umpires and the tribunal several times during his career. After 88 games with the Saints, ‘Bazza’ kicked the last of his 144 goals for the club in Round 22, 2001, with a post-siren kick that gave St Kilda a two-point victory over Hawthorn. Hall then transferred to Sydney and was the dominant forward for the Swans in an era that saw the club finally break a 72-year premiership drought in 2005. Hall was indeed captain of that triumphant Grand Final side (after Stuart Maxfield’s injury-enforced retirement earlier in the year), although debate rages to this day as to whether Hall should have been playing at all in that match. In the preliminary final the previous week, television cameras clearly showed Hall giving St Kilda’s Matt Maguire a ‘jab’ to the stomach, after which Hall was subsequently reported. However, Hall was sensationally cleared by the tribunal which ruled that Hall’s action had been ‘in play’ despite the ball being some 100 metres away from where the incident took place. That controversy notwithstanding, Hall assured himself of a permanent place in the heart of all Swans’ supporters by kicking two goals for Sydney in their very-low-scoring win against the Eagles in that Grand Final (the Swans won 8.10.58 to 7.12.54). 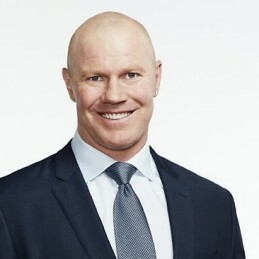 Over seven and a half seasons with Sydney, Barry Hall was a key focal point and made an enormous contribution to the Swans’ sustained finals involvement during his time there, a period which saw him kick 467 goals over 162 games. Given the Swans’ lock-down, low-scoring game plan of the time, Hall’s average of just under three goals a game was a significant one. Despite the many high points, Hall’s time at the Swans was blighted by several ill-disciplined acts of aggression which saw him suspended a number of times. The most notable of these was a ‘haymaker’ that struck West Coast’s Brent Staker in the jaw and led to a seven-week suspension for Hall in 2008. In 2009, after a further on-field incident, it was agreed that Hall and the Swans should part ways and he played his final game for the club in Round 13 of that season. The Western Bulldogs secured Hall’s services prior to the 2010, a move seen as not without risk, given Hall’s chequered past. But Hall repaid the Dogs’ faith handsomely. He led the Bulldogs to their first premiership of any description since 1970, kicking seven goals in the Dogs’ 40-point pre-season Grand Final win over St Kilda. He kicked 80 goals in the premiership season that year, and played an important role in the Bulldogs reaching their third successive Preliminary Final. His 2011 season was interrupted by injury but Hall was again a solid contributor. After announcing that the season would be his last, Hall rounded out his career in magnificent fashion, kicking 40 goals in his final eight games. Despite not attaining the ultimate success in his two-year period at Whitten Oval, Hall did not put a foot wrong during this time. He trained as hard as any other player, focussed his aggression mostly towards the the ball or with the utmost fairness at the player, and he endeared himself to most Doggies’ fans in his short time at the club. Those final years at the Western Bulldogs saw Hall finish his career with 289 games, 746 goals and a premiership medallion. Though not universally admired, Hall was without doubt one of the best full-forwards of his time. In 2015 Barry went on the reality TV show “I’m a celebrity get me out of here” and was very much one of the viewers most popular characters. Barry now enjoys a media role with Fox Footy.